Invite the outdoors in. 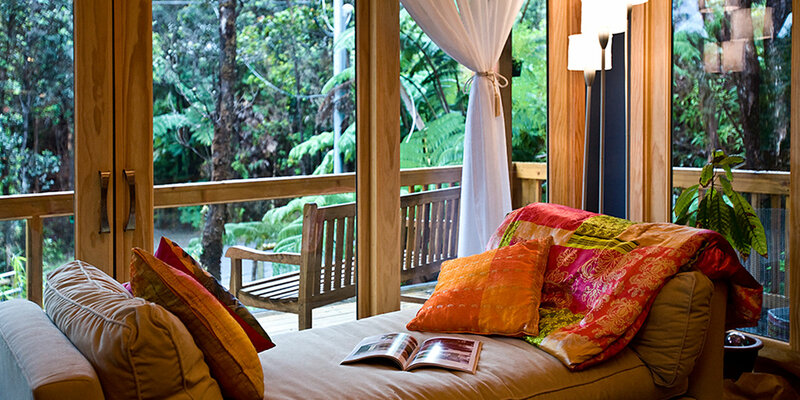 Make nature your home décor. Traditional Island life with a modern touch. An open-concept home. High ceilings, timber beams and wrap around Lanai. Thank you for visiting our site. Since this is our first post, we thought it would be a good opportunity to provide more background about the firm and our “green” building practice. 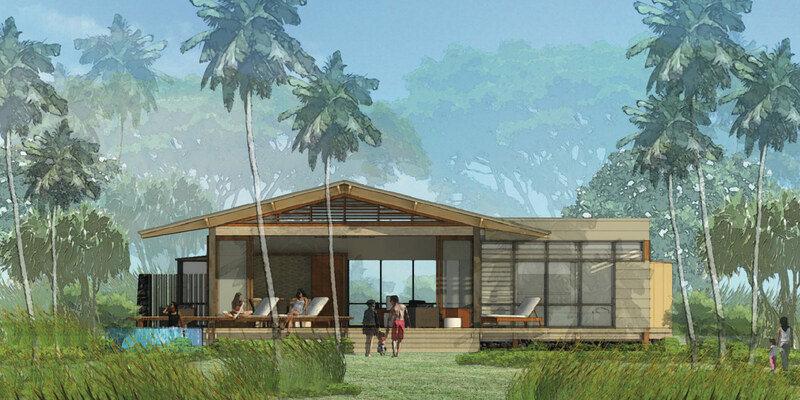 Mahana Homes was founded by Peter Fluker who started building solar homes in the 1970’s. Peter is considered a pioneer and today, he is still applying those design principles to work in harmony with nature. Rather than design big, wasteful, overdone luxury homes we opt for what we like to call “luxury in a small footprint”. You can still have the luxury items you like, but do so consciously and in a less wasteful manner. creating runoff problems by clearcutting and from an aesthetic one. Our particular kit home building system is thoughtful design. The pole/grid system foundation of our plan, allows adaptability to uneven sites, or rocky hillsides so there’s no need to remove large amounts of earth or forest to create a level housepad. The window systems we use and the orientation of the house to its site provide thermal gain in winter when you want it, and the overhangs help to provide shade in summer. Placement of windows also provides excellent cross ventilation which means you don’t need to rely on expensive air conditioning at the low elevations and are less likely to develop mold and mildew problems in the rainy areas. 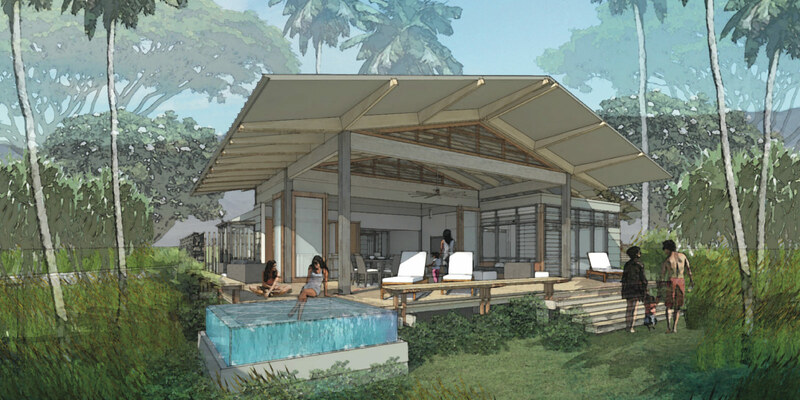 The functional simplicity and beauty of the designs also emphasize what the quintessential Hawaiian lifestyle is about, the seamless integration of indoor and outdoor living spaces that can be enjoyed year round. Along with eco-friendly design we advocate the use of technology to reduce the dependence on fossil fuels or municipal resources. Our homes have been built with solar systems with back-up electric, integration of water catchment with UV filters, photovoltaic cells, tankless-on demand propane for hot water, low voltage radiant floor heat at higher elevations, energy star appliances and low energy LED lighting. Integrating these alternative energy systems requires different planning in the actual structure. We work with a licensed Hawaii architect and engineer for all our designs to ensure compatibility and functionality as well as beauty and comfort. And last but not least, being “green” is about respecting our natural resources.The lumber suppliers we use were chosen from companies who have made sincere commitments to managed forests -this means lower impact harvesting, extensive replanting , and using no pesticides or inorganic fertilizers. We advocate the use of non-toxic finish materials for our timber structures. Exposed lumber is finished with low VOC stains and varnishes, such as Benjamin Moore Eco Spec rather than petroleum based finishes. From the start we like to meet with the homeowner to assess their site challenges, budget and particular needs then customize each kit in the design phase for the homeowner. Designing exceptional homes for over 30 years, traditional and contemporary designs that bring the beauty of nature into your indoor living space. Cut with expert craftsmanship and sustainably sourced, Beere Timber have provided the highest quality timber for over 30 years. Viceroy Homes are an industry leader, bringing over 55 years to the business of engineering and manufacturing custom home packages. Live your dream. Traditional or contemporary – our elegant designs bring the beauty of nature into your indoor living space. Contact us today to see if a prefab home or kit home is the right option for you. Proudly serving Hawaii and British Columbia, Canada.